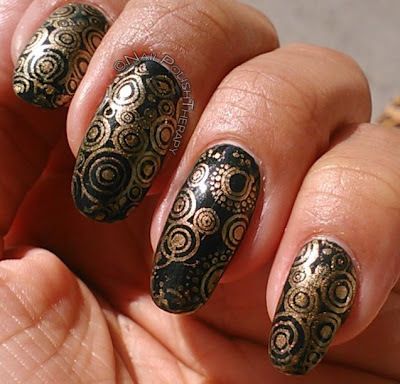 Beranda » Milani » Nail Art » Nail Polish » OPI » Stamping » Nail Polish 100th Post!! Nail Polish 100th Post! !, My goodness, 100 posts in less than 1 year. I never even thought I could get to this point. I thought I might loose the love of polish by now at the rate I was acquiring it, but my hobby gives me so much joy and is my creative relief, so I will continue to share and enjoy all my beautiful polish. Incidentally I am up to 724 polishes as of today and that doesn't count what's coming in the mail to me :) . This might sound like a lot to some of you but this is completely normal in the nail polish blogging world. I'm fortunate to have a supportive husband who doesn't give me a hard time about the time I spend on my nails, and I have no (human) children yet so I have more time than the average working mom to indulge in my nails. 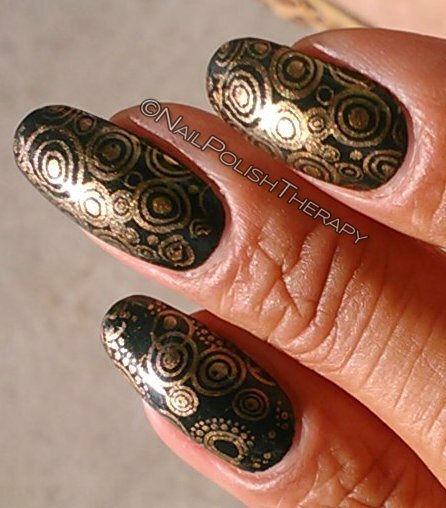 For this 100th post I have a combination of OPI Live and Let Die and Milani Signature Gold stamping design. I used a plate I got from Amazon.com and chose the circles because they reminded me of gears. I forgot to take a pic of OPI Live and Let Die on it's own but if you google images of it you can see it's a gorgeous deep teal with gold shimmer. It's from the James Bond collection and truly unique easy 1 coater. Please forgive me for just having 2 pics. These were the best I could get. Thanks for following and your kind words.